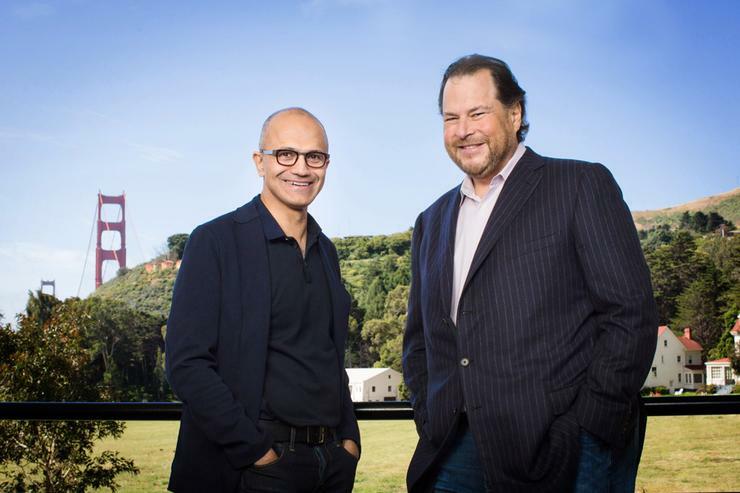 The moment Salesforce CEO Marc Benioff was dreading has arrived: Microsoft is wielding LinkedIn against Salesforce in the battle for the CRM market. Starting Tuesday, salespeople will get LinkedIn Sales Navigator data alongside other information in the Dynamics 365 Sales dashboard. Users who have both systems will see information from LinkedIn profiles inside the lead, contact, account and opportunity pages of Dynamics 365 Sales. Dynamics and LinkedIn Sales Navigator will sync their information every day so that LinkedIn’s system is up to date on activity from Microsoft’s CRM and vice versa. On top of the LinkedIn announcement, Microsoft also launched Dynamics 365 for Talent, to help companies manage their workforces, and Dynamics 365 for Retail to manage commerce operations. All these launches are part of Microsoft’s push to create next-generation systems of record for businesses that are based in the cloud. The company introduced Dynamics 365 last year as a suite of business apps that handle institutional processes like sales, inventory management and human resources. LinkedIn Sales Navigator is the enterprise social network’s product for professional salespeople. It has a number of features meant to aid with selling, like the ability to get automatic lead recommendations from LinkedIn’s data and to send users promotional messages through LinkedIn. The integration with Dynamics 365 for Sales means it will make more sense for people using Sales Navigator to buy Microsoft’s CRM and vice versa. That’s important as Microsoft woos companies that are also considering alternatives from rivals like Salesforce and Oracle. Microsoft acquired LinkedIn for $26.2 billion last year. While the enterprise social network remains a largely independent entity, Microsoft is working to integrate its offerings into the company’s other products, including the Cortana virtual assistant. Salesforce tried to block the acquisition last year, arguing that giving Microsoft control over LinkedIn’s data would hurt competition. The news comes the same day that LinkedIn announced it has 500 million members with profiles on its service. It’s not clear how much those members use the service, but they provide a base of information that Dynamics 365 can use for recommendations. People who work for small businesses also have a new sales tool available. Microsoft is rolling out its Outlook Customer Manager to people worldwide who subscribe to Office 365 Business Premium. Customer Manager is a lightweight CRM system that integrates with Microsoft Outlook on PCs, iOS devices and the web.